In a sea of content it’s hard to know where to start in terms of differentiating yourself from the rapidly growing Instagram community. We’ve touched on PLANOLY’s many capabilities that can help streamline the process of finding, planning for, and engaging with great content. Even still, how do you elevate your brand and take that next step? More and more we’re seeing the introduction of multimedia imagery on brand feeds which has set the bar (high) for those looking to stay relevant to their followers. Take Refinery29’s colorful feed for instance – it’s filled with a mix of punchy editorial imagery, graphic quotes, and brightly designed illustrations. Though while we don’t all have the same resources as a veteran company like R29, the below points should serve as an initial starting point when it comes to planning a dynamic and consistently fresh feed. While it’s tempting to add bells and whistles to your feed, it’s important to consider how it will affect your brand in the long-run. As a follow up to the PLANOLY team’s article on establishing a cohesive feed don’t let the big picture slip away. In an increasingly content-driven world, compelling visuals are key, but make sure they make sense when it comes to elevating your brand’s aesthetic and in some cases, values. 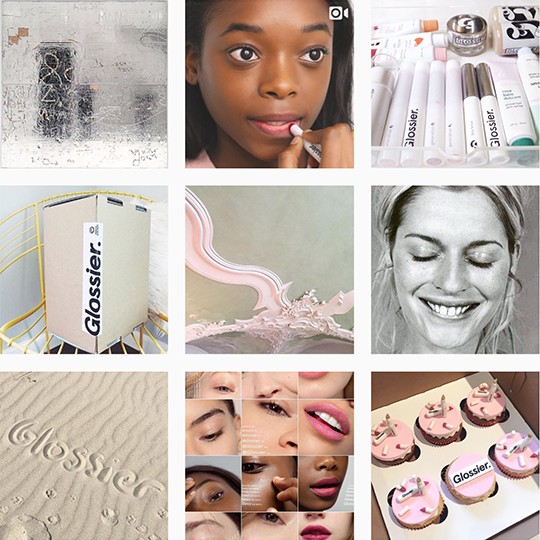 For example, look at Glossier’s signature #glossierpink. It’s rare that they ever stray away from posting anything outside their usual color palette, and the result? A massively loyal cult following on Instagram… and beyond! When it comes to logistics it’s also important to know how to properly work with visual content. For instance, did you know GIF files need to be converted before you’re able to post them? Did you remember to ask your graphic designer to send the final hi-res files of their latest illustration series? Did you trim your video clip to under 60 seconds? You get the idea. It’s easy to glaze over these technical details but it’s important to plan the time to consider these details – especially when it comes to maintaining quality imagery on your feed. With Planoly, you can upload GIF files to the Planoly app or web dashboard and Planoly converts them for you! Finally, whether you’re looking to user generated content (#rePLANOLY anyone?) or tapping independent contractors to create the content for you, consider how you choose the people you work with (and what they create) will help grow your community. When working with content creators, consider how they align with your brand values. Are you able to mutually tap into one another’s audiences? Do they show a genuine interest in growing with/creating content for your brand? Asking these questions provides a solid baseline for establishing good, collaborative, and long-lasting relationships.